In 2010 NASA's Fermi Gamma-ray Space Telescope unveiled a previously unseen structure centered in the Milky Way that spans 50,000 light-years that may be the remnant of an eruption from a supersized black hole at the center of our galaxy (image below). The structure spans more than half of the visible sky, from the constellation Virgo to the constellation Grus, and it may be millions of years old. 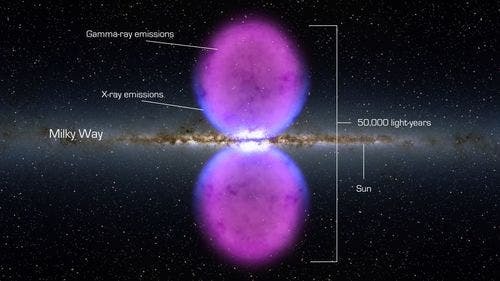 What atronomers saw "are two gamma-ray-emitting bubbles that extend 25,000 light-years north and south of the galactic center," said Doug Finkbeiner, an astronomer at the Harvard-Smithsonian Center for Astrophysics in Cambridge, Mass., who first recognized the feature. "We don't fully understand their nature or origin." Finkbeiner and colleagues discovered the bubbles by processing publicly available data from Fermi's Large Area Telescope (LAT). The LAT is the most sensitive and highest-resolution gamma-ray detector ever launched. Gamma rays are the highest-energy form of light. Other astronomers studying gamma rays hadn't detected the bubbles partly because of a fog of gamma rays that appears throughout the sky. The fog happens when particles moving near the speed of light interact with light and interstellar gas in the Milky Way. The LAT team constantly refines models to uncover new gamma-ray sources obscured by this so-called diffuse emission. By using various estimates of the fog, Finkbeiner and his colleagues were able to isolate it from the LAT data and unveil the giant bubbles. Scientists are conducting more analyses to better understand how the never-before-seen structure was formed. The bubble emissions are much more energetic than the gamma-ray fog seen elsewhere in the Milky Way. The bubbles also appear to have well-defined edges. The structure's shape and emissions suggest it was formed as a result of a large and relatively rapid energy release – the source of which remains a mystery. One possibility includes a particle jet from the supermassive black hole at the galactic center. In many other galaxies, astronomers see fast particle jets powered by matter falling toward a central black hole. While there is no evidence the Milky Way's black hole has such a jet today, it may have in the past. The bubbles also may have formed as a result of gas outflows from a burst of star formation, perhaps the one that produced many massive star clusters in the Milky Way's center several million years ago. Hints of the bubbles appear in earlier spacecraft data. X-ray observations from the German-led Roentgen Satellite suggested subtle evidence for bubble edges close to the galactic center, or in the same orientation as the Milky Way. NASA's Wilkinson Microwave Anisotropy Probe detected an excess of radio signals at the position of the gamma-ray bubbles. "Fermi scans the entire sky every three hours, and as the mission continues and our exposure deepens, we see the extreme universe in progressively greater detail," said Julie McEnery, Fermi project scientist at NASA's Goddard Space Flight Center. The image at the top of the page represents pictures shot during 144 orbits of the Hubble Space Telescope combined with images shot by the Spitzer Space Telescope. The Hubble scene is 10 times sharper than the Spitzer map, covering a 300- by 115-light-year area about the heart of the Milky Way. Our planet is located about 26,000 light years from the center of the galaxy.